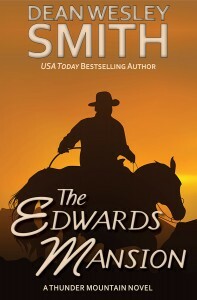 Offered a free trip into a remote Idaho wilderness that she loves and studies, Professor Dawn Edwards jumps at the chance. 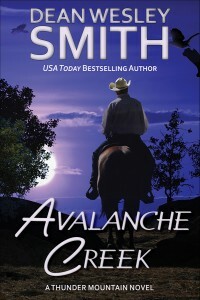 On the trip she meets Professor Madison Rogers, and they fall for each other before they even reach their destination. Bonnie and Duster Kendal, two of the world’s great mathematicians, hire historical interior designer April Buckley and architect Ryan Knott to design and furnish a huge lodge to the year 1900 standards. Only problem: The lodge can’t be built. It can’t exist. Yet, somehow it does because they’ve built it before. And fell in love in the process. 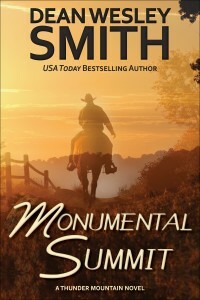 Returning to the time travel western world of Thunder Mountain, USA Today bestselling author Dean Wesley Smith weaves his most complex story to date. In one timeline, to help with an advanced math problem, Bonnie and Duster Kendal hire Brice Lincoln. In a second timeline, to help with an advanced math problem, Bonnie and Duster Kendal hire Dixie Smith. When Brice and Dixie finally meet in the past in a third timeline, instant attraction. And instant problems. A time travel western that stretches across timelines from the Idaho Wilderness to an old Boise hotel with a very special room. Sherri Edwards only wanted to refurbish an abandoned old mansion that carried her family name. Her goal: To bring the mansion back to original glory. But the ghost of the original owner kept chasing away all workers. About to give up, two friends suggest she go with them into the past, to see the mansion, meet the original owner, and figure out why he killed himself. In a small diner on the Oregon Coast, Kelli Rae meets a handsome man named Jesse Parks. Turns out she had seen him in a picture taken in an old mining town in Idaho over a hundred years before. Belle returns to her old hometown, looking for clues as to what happened to her great-great-grandmother a hundred years in the past. 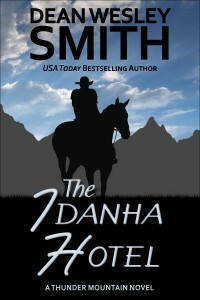 Zane, on a secret mission into the past, never expects to meet the woman of his dreams. A complex time travel novel that explores alternate realities, a future no one wants to face, and sets the Thunder Mountain universe going into the future. USA Today bestselling author Dean Wesley Smith wrote for decades about a jukebox that took a listener back to the memory attached to a song. The Jukebox Series consists of more than twenty short stories and gathered numbers of award nominations and movie options. 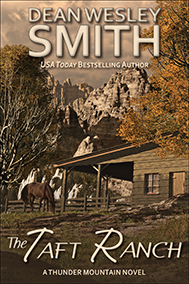 Then in 2012, Dean started work on the Thunder Mountain series of novels, starting with the novel Thunder Mountain. 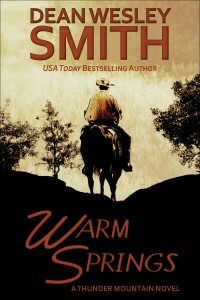 Time travel novels set partially in the Old West. 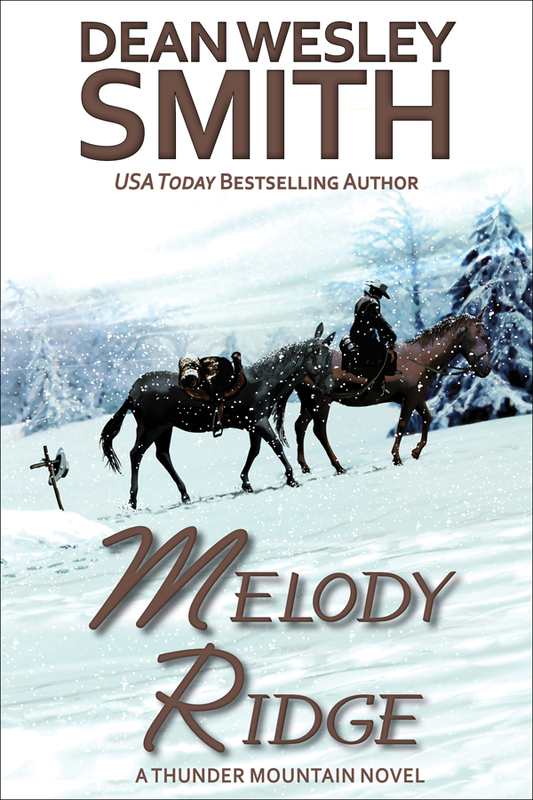 Now, finally, in Melody Ridge, he combines the two worlds and reveals the origin of the jukebox for the first time. Find out what happens if Stout from the Garden Lounge finally meets the inventors of the time-traveling jukebox—because the past might just change his future. Could the entire history of an Old West mining town be false? 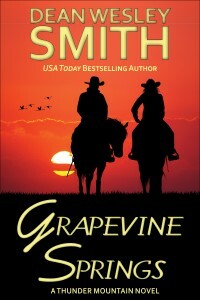 Did Grapevine Springs ever really exist? Duster Kendal wants to know the answer to that question. But to get the answer, he must turn for help from two top researchers who must risk everything, including their lives, to find the answer. 1902: Boise, Idaho. Megan Taber loves her job baking at the Idanha Hotel. 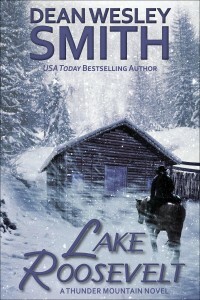 Widowed young, she knows the rest of her life revolves around her baking. Carol Kogan, a doctor and researcher from the future, eats breakfast every morning at the Idanha Hotel just for Megan’s fresh breads. Until one fine May morning in 1902, when Carol meets Megan outside the hotel. Before they finish their conversation, Megan collapses from a massive heart attack. Carol knows saving Megan with 1902 medicine would prove impossible. But saving her with future medicine might prove even more dangerous—for both of them. 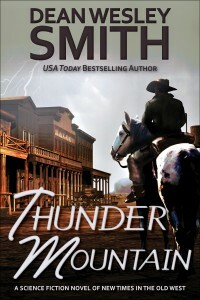 An innovative series that defies genre classification, USA Today bestselling author Dean Wesley Smith’s Thunder Mountain Series offers a compelling mix of science fiction, time travel, historical fiction set in the old west, and even a dash of romance. 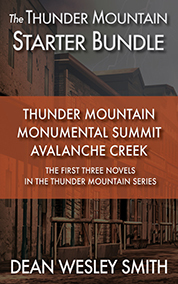 This starter bundle includes the first three books in the series: Thunder Mountain, Monumental Summit, and Avalanche Creek.